With the recent opening of their new brewery and taproom, I'd figure now is a great time to review another Wormtown beer. 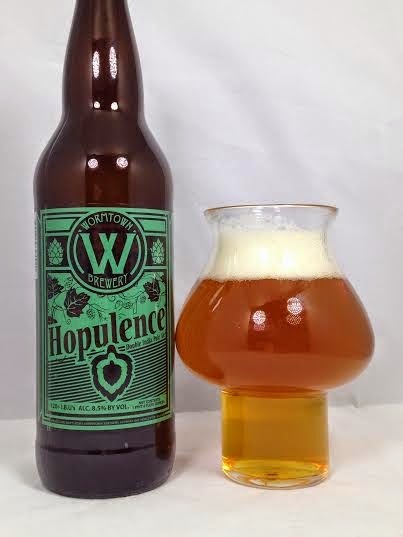 Hopulence is a big Imperial IPA brewed with Amarillo, Horizon, Summit, and Glacier hops with each hop added (as they say) during "every conceivable part of the brewing process". Pours a hazy, golden orange with two fingers of white, soapy head. There's no big juice presence on this one. It is grassy hops with pine and sticky resin. The taste reminds me a lot of Stone Imperial IPA's with an emphasis on garlic and onion and hop oils and resin. The difference being that this has a more palate-friendly addition of earthy hops reminiscent of fresh flowers and grass, but with tons more bitterness. It has a lot of that East Coast pine and spruce taste, but the finish comes back to the sticky hop resin. This is a full-bodied Imperial IPA for sure, but luckily not syrupy, thick, or chewy. At 8.50% there is no alcohol presence and given it's abundance of hops and oils, this is actually drinking easily. Hopulence came through on the bitterness for sure and it is clear they weren't lying when they boasted about the sheer amount of hops in this brew. While I would like my DIPA's to contain some presence of tropical juices, I'm not going to lodge any complaints with this easy-drinking resin and pine bomb.